Sci-Fi To Fact: Planet Hunters Find Worlds Like Earth As recently as 20 years ago, no one knew if planets outside our solar system existed. But now we know of more than 500. The biggest astronomy headlines in 2010 came from the quest for planets far outside our solar system that are similar to Earth. 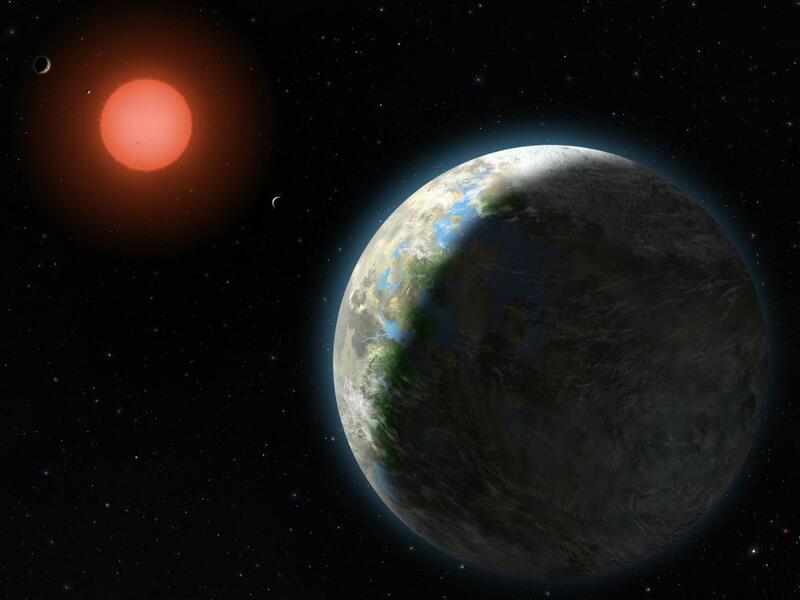 The inner four planets of the Gliese 581 system orbit the host star, a red dwarf 20 light-years from Earth, in this rendering from a National Science Foundation artist. 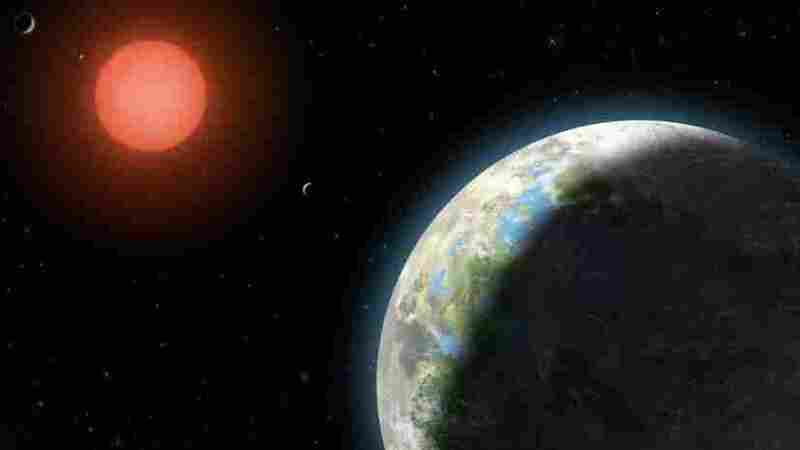 The planet in the foreground has a 37-day orbit and, like Earth, is far enough from the star for liquid water to exist. In the search for extraterrestrial real estate, it was a record-breaking year: Scientists found more than 100 new planets -- more than ever before. And a few of the planets look enticingly like our own warm and comfortable Earth. As recently as 20 years ago, no one knew if planets outside our solar system even existed. Today, the list of such "exoplanets" has surpassed 500. During the past year, researchers announced that they had detected whole planetary systems with three, five, and possibly even seven planets apiece. This year also brought the first discoveries from NASA's official planet-hunting instrument, a small space telescope named Kepler. The Kepler team has announced just a handful of new planets so far, but there are hints of hundreds more to come. But don't try to tell astrophysicist Marc Kuchner, a staff scientist at NASA's Goddard Space Flight Center, that discovering planets has become routine. The first five exoplanets detected by Kepler compared with Earth and Jupiter, which is our solar system's largest planet. The number below each planet indicates how many times larger its radius is than Earth's. "You can say that giving birth to babies is routine, right? It happens all the time," Kuchner says. "But if you're the person who found the planet, it's not routine for you. My heart skips a beat every time I hear about one of these things." That's probably because finding a new planet still feels like science fiction becoming fact. Those distant balls of gas, or water, or rock represent the possibility of other worlds, or even other civilizations. "Finding a planet like ours is exactly what got me into this game. I want to find out ... I don't just want to find a planet like ours. I want to know the answer to the question, 'Are we alone?' " Kuchner says. This year, for the first time, scientists say they found a planet just distant enough from its star that liquid water could exist there. But finding out if there is life on that planet will be a much more difficult task. Like most planets, it's still invisible. We only know that such planets exist because they change the light from their stars in subtle ways. For instance, if the light from any star dims slightly in a regular pattern -- every few days or years -- it's a signal that a planet may be orbiting that star, blocking a bit of the light every time it passes. Astronomers can then calculate how big the planets are and how far they are from their star. Also, when the planet comes between its star and us, a tiny fraction of the star's light passes through the planet's atmosphere. It's like a sunrise or sunset around the edge of the planet. "And that light, we can analyze and we can use it to tell us about the chemistry of the atmosphere," Kuchner says. Such analysis "is a whole new era in planet science," says Alycia Weinberger, a staff scientist at the Carnegie Institution of Washington. "There's been just a tremendous number of papers that have come out in the last year and even before that, trying to characterize what planets are really made of." It is also now possible to see a few distant planets directly. Astronomers can create a kind of artificial eclipse of a star inside a telescope. When the star's light is blocked, it sometimes reveals planets: faint dots moving around the star. All of these techniques have unveiled a shocking degree of planetary diversity. "There are planets that are similar to things that we have in the solar system, and there are planets that are so different that we didn't dream of them," Kuchner says. "I mean, we literally didn't think of them -- that there could be such crazy things out there!" A planet turned up recently with an atmosphere rich in carbon. On a planet like that one, diamond might be as common as rocks are on Earth. Astronomers used to think that planetary systems had a natural order, with small planets like Earth close to the star and stately gas giants like Jupiter far away. But then they found lots of huge planets right next to their stars, zipping around in superfast orbits. "That is still a real puzzle," Weinberger says. But it's the kind of puzzle that scientists love. "Fields in which there is nothing left to figure out are really no fun at all," she says. "And I think the exoplanet field has been attracting lots of bright young people because there are all these interesting problems to solve." They're looking forward to using a powerful new tool. NASA is building a big new space telescope called the James Webb Space Telescope. It will be 100 times more powerful than the agency's well-known Hubble Space Telescope. Astronomers get a dreamy look in their eyes just talking about it. So for them, it was probably the worst news of 2010 when NASA announced, in mid-November, that this dreamboat telescope was going to cost $1.5 billion more than budgeted. The agency hasn't said how it will cover the cost overrun, or whether it still intends to launch the telescope within five years, as previously planned.